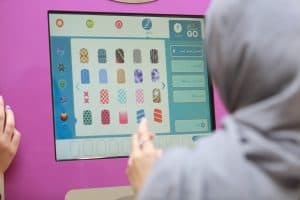 Home » Fingernails2Go launches in the Middle East! Our kiosks have reached a new destination – Saudi Arabia! We are happy to announce that Fingernails2Go have launched in the Middle East and are now live in Saudi Arabia, Riyadh. We are located at the Granada Mall in the Paris Gallery. Why not stop by and find your perfect nail design. You will be greeted by our lovely team members who will assist you in designing your nails making sure they are nothing less than perfect before you leave! Leading Luxury Retailer in the Middle East! The Paris Gallery offers a premium collection of over 650 international brands across a range of products. You can find perfumes and makeup to jewellery and accessories, and now with the wonderful instalment of Fingernails2Go you can get your nails done in just seconds to finish off your shopping trip at the mall. All first time users have been extremely impressed with the efficiency and quality of their nail prints. There is also the option of printing onto a set of artificial nails to save for application later. By no means will you be limited with choices using our digital nail art kiosk’s! Stop by and have a look through our library of thousands of integrated designs and choose 1 or even 10 designs that suits your style! Remember to share your designs with us on Facebook, Instagram and Twitter using #fn2go. It’s all happening here at Fingernails2Go. Make sure to follow us to stay up-to-date with all the news on digital nail art. We also share all things beauty and fashion so be sure not to miss out on the latest trends. If you are interested in a business opportunity with us please click here, we would love to hear from you! Our Sales Team are always on hand to provide you with more information about our product so don’t hesitate to get in touch. Happy printing from the Fingernails2Go Team!